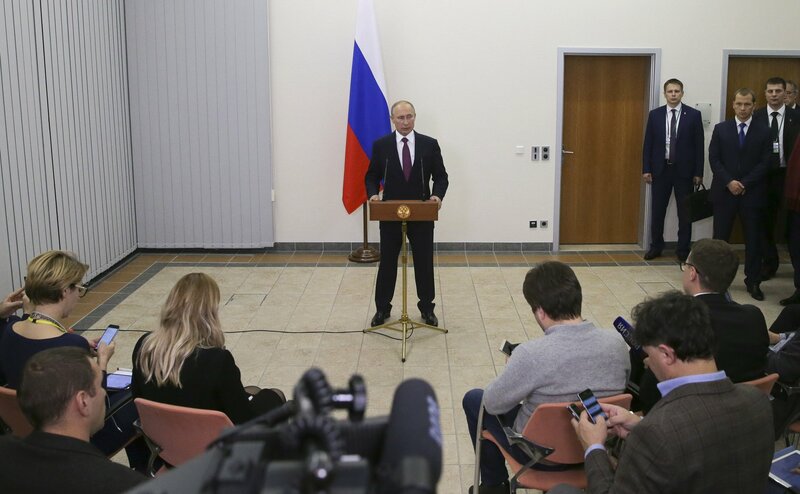 Russian President Vladimir Putin during the press conference in Berlin. The Kremlin is satisfied with the results of the Ukraine peace talks in Berlin. "In general, positively," Russian presidential spokesman Dmitry Peskov said when asked to assess the results of the Berlin summit. He recalled, "We have never had any inflated expectations, we warned against inflated expectations. We said that another confirmation of the commitment to the fact that there is no alternative to the Minsk agreements is a positive development in the current situation, which deserves a positive assessment." After the talks of the Russian, German, French and Ukrainian leaders, all of them pointed to the need to comply with the Minsk accords. Peskov noted that after the previous Ukraine peace talks in Paris in October 2015 "we could not boast that it was an effective year, even though the work at the expert level never stopped during the year." He added that "the implementation of the Minsk agreements stalled throughout the year." "Throughout the year, Russia expressed regret in this regard stressing every time that we expect the party, which should fulfill these obligations, namely, the Ukrainian side, to take appropriate steps," the Kremlin spokesman said. "In general, of course, the mere fact that the work in the Normandy format continues, the mere fact that the parties continue to synchronize watches at the highest level deserves a positive assessment," Peskov said.